The Opera browser started out in 1994 as a research project in Norway's telecom company, Telenor. Independent development was continued by Opera Software ASA in 1995. The first public release of the Opera Browser was version 2.12 although earlier demo versions have been found and screenshots of the 1.0 version are available on the web. Opera's co-founder Jon von Tetzchner made the first public announcement of Opera on usenet on July 14th 1996. He used the following introduction, which after many years of development still capture the core qualities of Opera! Are you looking for an alternative to Netscape and Microsoft Explorer? Do you like the idea of having an MDI user interface and being able to browse in multiple windows? Care for a full keyboard interface for your browsing? Want to start up with multiple windows? Is your browser slow? Try Opera at http://opera.nta.no/opera. This page tries to give a short overview of Opera's history, from the early beginnings up to the most recent state of the art releases. Opera Software now provides their own Feature History page, which is much more detailed (and up-to-date) than this page. Though not publicly released there are screenshots of the then-called MultiTorg Opera. It's fun to recognise the features that are still present in Opera's current form. In serverlogs across the web evidence of a Multitorg Opera 1.0b4 can be found. I'm still hoping to find it one day. The first public versions of Opera was the 2-series. They are of course extremely outdated but test-driving them you can witness the birth of the legend that is called Opera. The oldest version found is a Norwegian demo version of Opera 2.0 which was included with a PC Magazine. It will only load local pages but you can already see a lot of key features that have made Opera famous! This is serious test-driving fun! Series 4: "Fly the web!" / "The Best Internet Experience on any Device"
Opera 4 was long-awaited the first browser based on a new cross-platform core which facilitated the release of Opera for different Operating Systems and thus speeding up Project Magic. The core supported more standards such as CSS1, CSS2, HTML4, XML and WML and a new integrated e-mail client was included. The O4 browser was meant as the leap towards the larger public. Unfortunately the earlier versions were very unstable and buggy and didn't do Opera's reputation much good, though the later maintenance release 4.02 was very usable. Series 5: "The fastest browser on earth"
The 5 series really made the jump to the large public due to the new ad-sponsored version instead of the 30-day trial period. Furthermore Opera 5 was stable and during following releases it gained new features such as the integrated Instant Messaging, the fantastic mouse-gestures, hotlist panels and the integrated search. The 5 series ended with the 5.12 release which was a good and mature release. Series 6: "Simply the best Internet Experience"
The Opera 6 series introduced the long-awaited unicode support. Also a new SDI/MDI interface was introduced, facilitating the transition from the SDI-browsers to Opera's unfulpraised MDI-interface. During the later bugfixreleases the kioskmode was enhanced, the integrated searches became editable and a lot of printing problems were solved. When it retired, the Opera 6 series was stable and feature rich and formed an increasingly strong competition for Netscape and Internet Explorer. 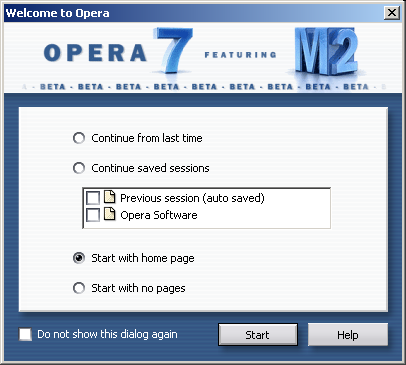 Opera 7 was released in early 2003. It featured a brand new rendering engine under the name Presto, which enhanced and expanded its support for standards. The major changes included support for W3C DOM, reflow capabilities allowing for more dynamic pages, and BiDi (right-to-left) support (Opera 7.20), as well as the Small Screen Rendering technique for handheld devices. The entire interface was redone, making use of a custom cross-platform skinning system and the entire UI became configurable: keyboard shortcuts, mouse gestures, menus and toolbars! With the new combined SDI/MDI interface the user has even more power at his command and new innovative features such a FastForward, Notes and Slideshow make the user experience even more enjoyable. An especially noteworthy change in Opera 7 is the new mail and news client, called M2. This e-mail client is based on a powerful filtering system and offers revolutionizing mail organizing abilities, which for many people changed the way they handle their e-mail. Opera 7.5 introduced a brand new default skin as well as a revamped interface that removed a lot of clutter. A RSS newsreader as well as an IRC chat client was introduced and M2 was optimized for speed. With the 7.60 beta version, Opera introduced their first iteration of a multimodal browser that can be operated by voice commands alone and that can obey aural CSS while reading pages aloud. A true step forward! Series 8: "Free at last, free at last!" Opera 8 was released in early 2005, and in September that year the ad banners were removed and Opera is now completely free! Series 9: "Your web, your choice"
Opera 9 is the first of the next generation of browsers. An important change is the new Preferences back-end: all settings can now be changed from opera:config, and Site Specific Preferences are now also available, making it possible to have true SSP stylesheets and settings. New features further include a simple source editor, improved history, and an interface for adding and editing searches: simply right-clicking in a search field allows the addition of new searches. Another major new feature is the content blocker: remove ads from pages in a powerful way, not on an image-by-image setting, but for a full domain. This version also introduced widgets: small webpages that run outside of Opera, interact with webservices and are completely platform independent. The Opera 9.10 update introduced a fraud-filter, which checks pages for trustworthiness. Opera 9.20 introduced Speed Dial; when opening a new tab, thumbnails of your favourite sites appear, providing unprecedented easy access to them. A major new feature is Quick Find, which indexes the content of every page you visit, making it easier to retrieve pages from history. The advanced history search is automatically available in the addressbar. Furthermore, Opera Link is introduced, which allows you to automatically synchronize bookmarks, notes and Speed Dial settings between Opera installations on desktop and Opera Mini. In the Security corner, Opera now comes with Netcraft anti-phishing and Haute Secure anti-malware filters, and supports the Extended Validation (EV) for websites. Receiving a major internal overhaul is Opera Mail (M2) with improved performance and stability. To cap it all off, Opera 9.5 comes with a fully redesigned skin, marking the big changes under the hood with a big change in the UI. The follow-up release, Opera 9.6, mostly included work on the Opera Mail client, such as Low Bandwidth Mode and ability to follow threads. It also introduced Feed Preview, which effectively styles RSS News Feeds, enabling the user to decide whether or not to subscribe to the feed. Hidden in the preferences, the new Scroll Marker improved the readability of long pages,. Developed under the 'Peregrine' moniker, Opera 10 moved up its standard support a notch and passed the Acid 3 test. A notable CSS improvement was the introduction of Webfonts support, which included SVG fonts. Support for alpha-transparency was also improved, in the form of RGBA and HSLA support. More striking changes were introduced in the UI, which underwent another default skin change, partly prompted by the development of Visual Tabs, which show thumnail previews of open pages. Speeddial was given some configuration options, inline spellchecking was added, Opera Mail received HTML editing capabilities. Also introduced to this release was an Auto Update feature, integrated crashlogger and Opera Turbo. This service speeds up slow (dial-up) connections, by sending the page through Opera's proxy servers which compress.